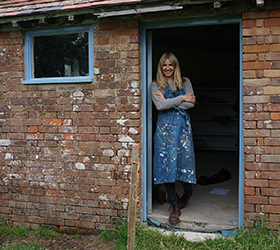 We catch up with Dorset maker Jenny Sibthorp on her Dorset life nestled in the Isle of Purbeck. Dorset Tea (DT): Are you local to Dorset or have you led “another life” before? Jenny Sibthorp (JS): I was actually born in Dorchester and grew up in the Isle of Purbeck so I think I can say I’m a local J Though I spent a number of years away: travelling, studying at Sussex University and I also lived in London for 6 years. JS: Well interestingly, I hadn’t worked in a creative business until I moved back to Dorset from London. I suddenly felt incredibly inspired to create, draw, print, basically trying anything which allowed me to use my hands productively. My popular Dry Stone Wall print is directly inspired from the walls I see on my wanders in the countryside, particularly up at Houns-Tout and Worth Matravers. DT: How did you come be a textile designer and print maker? JS: Leaving London gave me an opportunity to re-evaluate what I wanted to do as I wasn’t satisfied in a 9-5 office job. I’d always enjoyed screen printing and working with textiles through upholstery as a hobby and I decided to take a risk after saving up some money, I figured it was a ‘now or never’ situation! So far, it’s paying off quite nicely! DT: How to you live the Dorset life? JS: I think living in Dorset we’re all so incredibly lucky, we have (I’m totally biased) but I think the best countryside in the whole country! It’s so varied, so rugged and so beautiful. I think it’s easy to take this for granted sometimes, but what I like to do, particularly when I’m feeling a bit stuck creatively is fill up a thermos with tea and just walk for miles, taking routes I didn’t know existed, and just appreciate the freedom we all have. There is an abundance of local produce, great pubs, beer festivals and such varied wildlife to look out for. DT: Most importantly – where can customers buy your lovely designs? JS: You can buy from my own website www.jennysibthorp.com and I’m also starting to expand my stockists – so keep your eyes peeled for updates on shops you can buy my products in!